I bet you thought this post would be all about your email in-box, since it's reminiscent of the Tom Hanks and Meg Ryan classic RomCom, but it's actually about our modern-day Pony Express and how much I LOVE to get things via snail mail (I also love to receive email that isn't a) work-related or b) SPAM.. Feel free to show my in-box some love). One of the things on my 101 in 1001 List (a lengthy, short-term bucket to-do list), is to mail a card/letter to someone, once a month for the entire duration of the list (I haven't really done the math yet, but it's like just shy of 3 years). My mailbox is typically full of unwanted junk mail (credit card offers, go away) and definitely unwanted bills (frankly,those can go away too) but on occasion, I get something great, whether it's an unexpected note from a long-distance Bestie, with pictures from a recent trip (Thanks, Kitty Kate! ), or a FANTASTIC subscription box, that I literally wait ALL.MONTH.FOR. 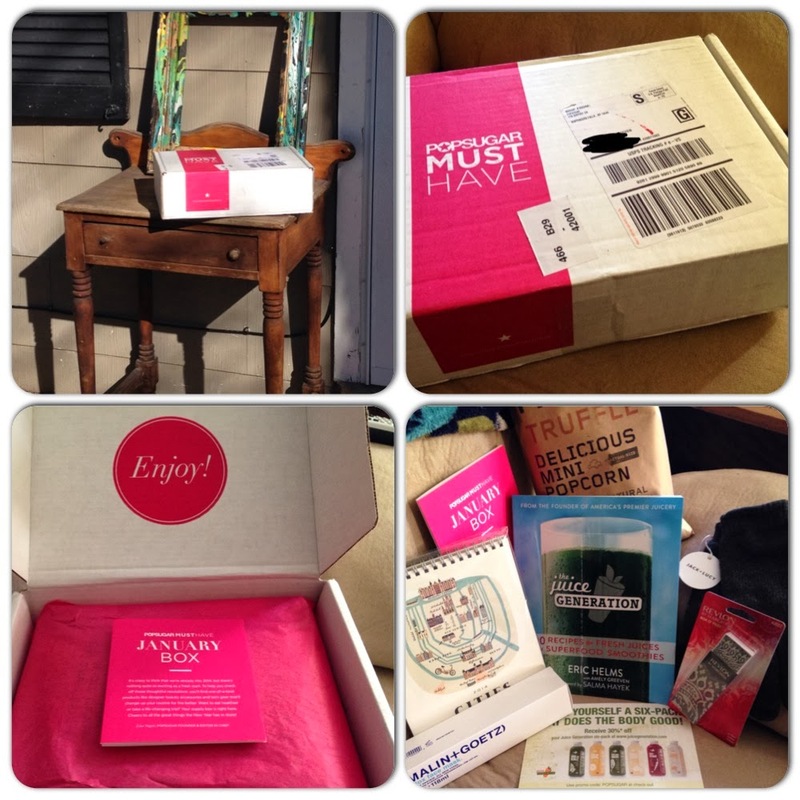 Let me introduce you to one of my guilty pleasures and favorite things to receive in the mail: The PopSugar Musthave box. Since I'm just introducing you to this fantastic subscription box (I'll start doing monthly reviews starting next month) let me give you the details. 1. It's a monthly subscription box, filled with products that PopSugar editors are raving over. From edible products, to full-size beauty products, to gift cards to redeem products to adorable accessories, etc. etc. etc. Items in the boxes provide a fun alternative to the undesirable mail that crams itself into our mailboxes. 2. They have various subscription plans. "I get paid the big bucks, " said no teacher ever, so I go with the monthly $39.95 plan. They also have pre-pay plans that give you the boxes for a discounted-rate. With any plan though, shipping is Gratis! 3. The value of the box is TOTALLY worth the price you pay. You get quite a bit of bang for your buck. I once received an awesome blanket scarf, sold at stores like Nordstroms and valued at $68. This month the box contained the following: Bag of truffle popcorn, a full-size (Malin+Goetz) detox face mask, Rifle Paper Co. Cities around the World illustrated calendar (Adorably whimsical! ), Revlon by Marchesa box o'files, Jack + Lucy touch-screen digitally friendly gloves, and The Juice Generation: 100 Recipes for Fresh Juices and Superfood Smoothies book, along with a 30% coupon for juices/merchandise. 4. It auto-renews with the monthly plan, but you could sign up for a monthly box and make it a one-time box (just cancel after you've ordered the box and it's been shipped) or sign-up and get a 3, 6, or a full-year plan to give as a gift. It's also a perfect gift choice for a girlfriend that is hard to shop for! Disclaimer: Obviously since I'm new to blogging, I am clearly not receiving the PopSugar MustHave box for free, in exchange for a review on the fantastically, fun products that are contained in said box, to be read by hundreds of fabulous followers. If you want to spruce up your typical snail mail loot, I definitely recommend checking out PopSugar's MustHave box. I also recommend, today, taking a few minutes to send a little note or "Thinking of You" card to someone special (Your Boo, Bestie, Sibling, Parental, etc). You'll brighten the recipient's day when they see an unexpected surprise in their next mailbox haul. OOO I have a Julep Maven subscription, but may need to look into this one! Mama - I have Ipsy too.. I seriously love subscription boxes - Such fun surprises. I've gotten a few of Julep Maven polishes, in both PopSugar MustHave boxes and Ipsy cosmetic bags. Goes on smooth and they have great colors! At work, I operate under a 5-5-2 rule. 5 personal phone calls (just touching base with volunteers), 5 personal emails (doing the same thing as the phone call) and 2 hand written notes/cards to be mailed to my volunteers. I have a feeling that your volunteers really appreciate that 5-5-2 rule. Going that extra step takes very little time and makes a HUGE difference. Too bad more people aren't like you, when it comes to that personal touch. I agree with you - those things are definitely forgotten nowadays, and they really have the power to turn someone's day around.